Now that the repulsive pervert Larry Nassar has been locked up for life for crimes against countless young women and girls, we can delve deeper into the culture that allowed this monster to thrive. The purpose of gymnastics is not to go to the Olympics. The purpose is not to achieve elite status. It's not to win, it's not to get a college scholarship. The purpose of gymnastics is to learn cool tricks. And no matter how much you emphasize the healthy and positive byproducts--discipline! Perseverance! Fitness! Hard work!--the bottom line is, your job as a coach is TO TEACH KIDS COOL TRICKS. So get over yourself. We are not curing cancer. We are not saving lives. We are not performing rocket science. Get over yourself. 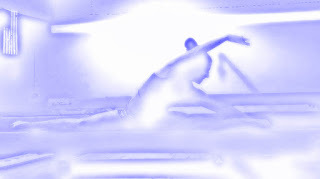 The hubris...the audacity...the VANITY of these coaches who are so egotistical as to place what they perceive as their OWN triumph ahead of the well-being of small children, is what has enabled the sexual, physical, emotional, and psychological abuse to thrive in the sport of gymnastics. Your job is to build kids up. Your job is to help kids have fun. Your job is to make kids love gymnastics. BECAUSE YOU ARE A TERRIBLE PERSON. There is a reason why we do gymnastics. It feels like flying. It feels like a rush of adrenalin at accomplishments big and small. It feels like an optimistic embrace of infinite challenges. It feels like joy and delight and happiness. It feels like being beautiful. It feels like art. It feels like an urge to share with everyone that this is the greatest sport in the world. It makes you want to go again and again and again. This is why we do gymnastics. I'm standing at the end of a carpeted foam runway in a new purple leotard, waiting for the signal to run full speed and launch myself upside down and over a large shoulder-height vaulting table. I'm so jittery I'm afraid I'm going to twist an ankle before I even get to the springboard. There are sixteen events happening at once in this huge facility--4 of each apparatus--so I'm surrounded by music, applause, shouting, the slam of springs, the squeak of bars, and the constant buzz of excited kids. It's pretty much your average gymnastics meet. Except that my last competition was in 1993 and I'm now 40 years old. If this sounds like one of those bizarre recurring dreams where you find yourself back in high school, it sure felt that way at times. But not only did I sign up for a gymnastics meet 24 years after I'd last competed, I wasn't the only adult there. Eighteen others were in it with me, gymnasts of varying levels and backgrounds and experience, all crazy enough to get out there with the kids just for the thrill of flipping and flying. I'd heard about this AAU meet from a network of adult gymnastics enthusiasts, and the chance was just too good to pass up. With part time coaching allowing me an hour or so a week to play around in the gym, and CrossFit making me feel stronger than ever, I had begun to realize that I could perform many of the same skills that I loved as a kid. 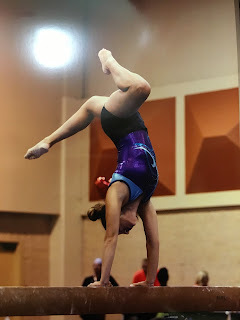 I decided that my skill level was appropriate for Gold division (within the USAGymnastics Xcel program), and when I turned in my entry, I had a month and a half to prepare. Oh, and I'd never vaulted over the table at that point. If you're a former gymnast who hasn't chalked up for the better part of a decade (or two), who hasn't looked down from the four foot height of a beam since you were four feet high yourself, who can't turn upside down without seeing stars, I have two words for you: muscle memory. It's true: if you can get yourself into reasonably good shape by any means--running, Crossfit, aerobics, triathlons, barre classes, tap dancing to gangsta rap--you will be amazed not only at what you can still do, but at how fun and addictive it is. Not only did I manage to vault over the apparatus, I put together a bar routine with two kips, a cartwheel and handstand for beam, and a side aerial plus a front handspring-roundoff connection to fulfill floor requirements. Simone Biles I am not. But pretty agile for a mom of three, I am! But listen, former gymnasts: don't worry about what you used to do, enjoy what you CAN do. Because my marathon friends-- thirtysomething professionals and fortysomething housewives--don't enter races to beat the world class athletes. They enter because they CAN. My tennis-playing-mama-friends, they're not trying to beat the local varsity kids, they're playing for the excitement of the game. You can have fun and stay active by putting a basketball goal in your driveway, and truly, no one is tallying your airballs. Gymnastics, too, is worth doing at ANY level because it's thrilling. It's challenging. It's impressive. It's a great workout. Throw out your old standards of perfectionism, check your ego at the door, and try to remember why you did gymnastics in the first place: because it's fun to do cool tricks. Are you completely out of shape? Not a former gymnast? Guess what. Gymnastics is for you, too! You can start at 25. You can start at 55. Know what's more fun than an elliptical machine? CARTWHEELS. Want to compete? Bronze division has your name all over it. With very minimal, beginning level skills, you can compete, and you can be proud of that forward roll or that shaky walk down the beam or that heavy thudding cartwheel, because you are still doing something way cooler than speed walking. I went into this adult competition with a "bucket list" mentality. A one-time crazy experience, like skydiving. I just wanted to remember what it felt like to compete, to see if I could score higher as a chill adult than I ever did as a nervous kid (I did, in every single event), to put all these recycled tricks to use. In the end, what I found was that the best part was meeting people who were as crazy as I am. And now I'm already thinking...maybe I should do this again? Are you intrigued? Do you want to bust out that sweet 1996 color blocked crushed velvet key-hole backed leotard with matching scrunchie and join in the fun? Of course you do. Go find a local gym and turn upside down. Here are some random resources and FAQ. I've only just gotten involved in the world of adult gymnastics! There are people who know WAY more about this than I do. Surf the internet. Find Facebook groups. Ask questions. I'll add more FAQ and links as I learn of them. So what organization is putting on adult competitions? The meet I attended was an AAU national competition. This meet attracts enough adults to have an entire ladies' division! For me, that was key--competing alongside others like me! Levels/routines are according to USAG. More info here on AAU. 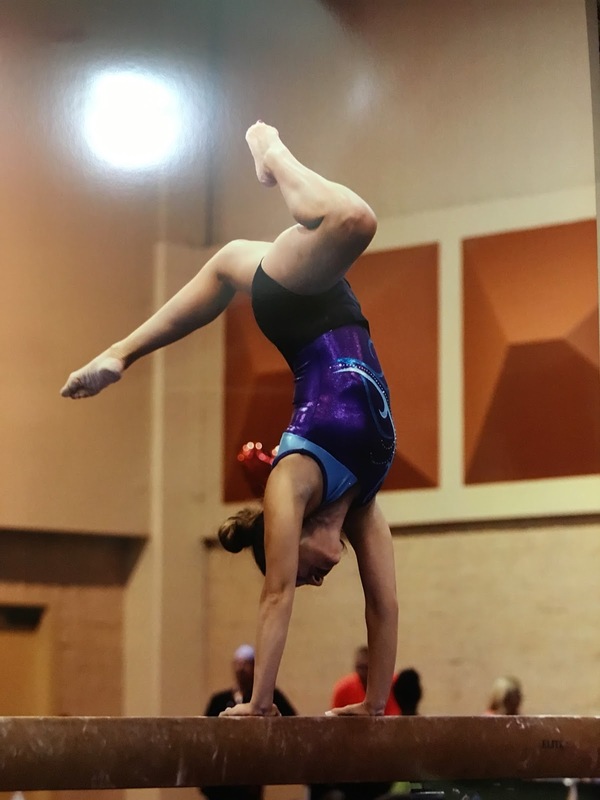 NAIGC is club level gymnastics in college, like intramural sports--but the great thing is, you don't actually have to be affiliated with the college. Or in college. Or something. You can be really good, or you can be a beginner, but you'll be scored according to level 6 or level 9 rules. So you might get a 3.1 on something, but it's all good, because you're having fun! Here's the important thing about NAIGC--they have MEN'S gymnastics too. What about USA Gymnastics? Are they encouraging adults to compete? No. USAG-- please emerge from your insular walls and take note of how many adults shell out hundreds or thousands a year to run 5Ks and marathons, participate in triathlons and obstacle courses, or subscribe religiously to fitness regimes like Crossfit or Bodypump. If each state simply had a USAG-affiliated "alumni" or "masters'" type of competition--particularly with a charitable motivation like many 5Ks--old coaches would be crawling out of the woodwork to step out once more and show their gymnasts what they can (or can't) still do. If USAG were truly interested in growing the sport, they would start thinking outside of the box. Are you listening, USAG? So what's the minimum skill level I could do in a competition? If you've been out of the gymnastics scene for a while, there's a fabulous program within USA Gymnastics called Xcel. The lowest division, bronze, is constructed to be totally inclusive for beginners! For vault, you can actually run and do a straight jump on the springboard, then a handstand to your back. Your very minimum on bars is jump to front support, back hip circle, cast off. On beam, you can do a forward or backward roll, a partial handstand, or a lever to touch the beam, then a jump off for a dismount. Floor--can you do forward rolls? A single cartwheel? You're good! You can do this level in AAU meets, you can also do it in USAG meets. USAG meets are the predominate type of meet in the US. The vast majority of kids do USAG. But here's the thing. There's no age limit. You can be in a meet--you might be the only adult in a sea of children, but you can do it! There are plenty of adults across the country that simply go out to any meet and compete alongside the kids. Do I have to wear a leotard? Yes. Yes? Ok in AAU yes, but you can wear lycra shorts, hooray! NAIGC too? I think so, but I'm not sure. NAIGC people can help with that. Do I need a coach to attend a meet? No! If you're like me, just a gymnastics coach who enjoys playing around, you don't have a coach telling you what to do. In the AAU meet, everyone simply helped out everyone, and a coach who happened to be at the meet stepped up to help us all!